Weekend to Remain Unsettled, Big Warm Up On the Way! April 2016 finished as the second month in a row with below average temperatures and well above average snow. Continuing the trend we saw in March, we experienced swings of warm weather followed by a couple of large, cold, wet storm systems that allowed our snowfall to finish way above average! If you are at all curious about how January – March went so far this year, you can see that data at the link below. 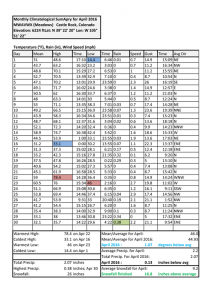 I post results of each month’s weather data after the last day of each month. There were some concerns about our strong El Nino pattern breaking down too quickly through March and all but eliminating our chances for a wet spring. March and now April 2016 delivered in a big way for moisture in Colorado and much of it in snowfall. 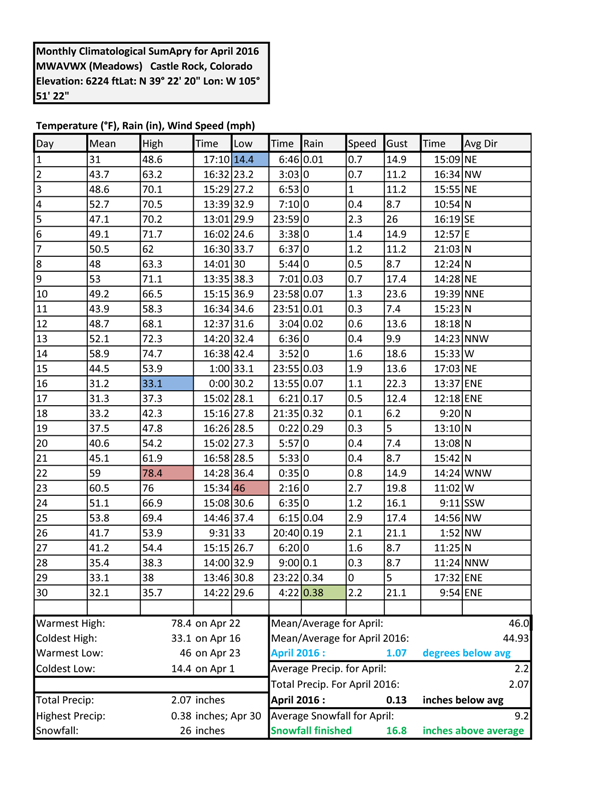 Normally we see higher than average temperatures in an El Nino spring accompanying the higher than average precipitation, but April 2016 was the second month in a row with below average temperatures and well above average snowfall. First we look at the temperatures. I saw a lot of similarities between March and April 2016. 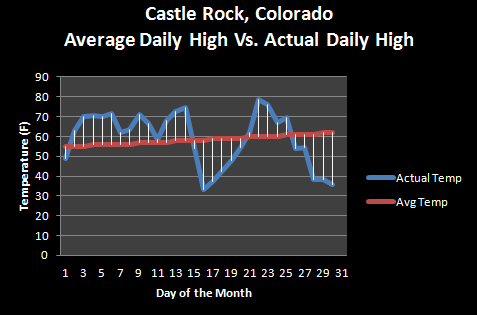 The front half of the month started out relatively warm and quiet while the second half of the month saw much below average temperatures as a series of storm systems moved through. As is often the case in El Nino spring months, it was very, very soggy! The colder temperatures (again this was unusual for an El Nino spring month) ensured that a large amount of the precipitation that fell came down as snow. 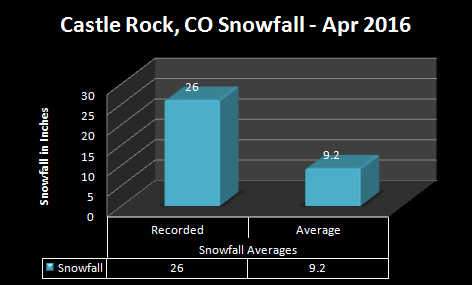 In fact, April 2016 finished way above average in terms of snowfall. April is our third snowiest month and one of the wettest months of the entire year. It is not uncommon to see Aprils with large amounts of snowfall. April 2016 finished a staggering 16.8 inches over the normal monthly average for snowfall! To say it was a snowy month is an understatement but surprisingly didn’t crack one of the top snowiest Aprils in history. This was a snowy April, but we have had much snowier April’s in the past! 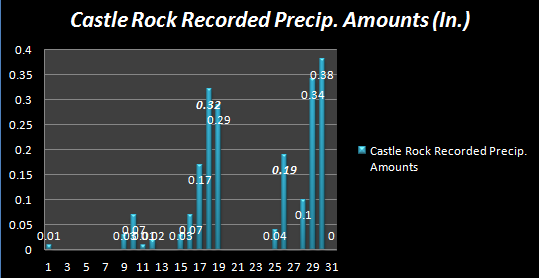 As if we needed any more proof of how soggy April was, here’s a look at collected precipitation and days they were collected. You can see we saw big numbers in the second half of the month pretty consistently. 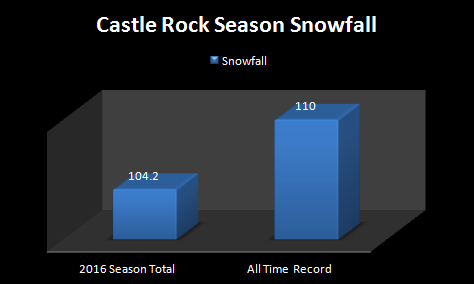 Speaking of which, this year Castle Rock has seen a large amount of snow! The city is only one good storm or maybe 2 smaller storms from seeing the most snowfall recorded in a single season in history. The previous amount was set in the early 80’s (folks who’ve been here awhile will remember the infamous 1982-1983 season accompanied by the Christmas Blizzard of ’82!) I took a look at a lot of stations along the Palmer Divide and foothills and many locations are very close to breaking their snowfall record too. Will we make it? Time will tell! The CPC predicts a better chance of cooler and wetter than average weather through the month of May. Given the “troughiness” of the weather pattern (lots of storms projected to move through, generally every week or week and half or so) I can definitely see this being the case. Although I would consider this unusual to what we normally see in May during an El Nino year. I took a quick look at the GFS going out a ways and saw that while we do get some decently warm days here and there, every week or so a big storm system moves through and cools things back down. I saw no indication of strong ridges building in the first half of May, meaning temps will most likely be at or below average the first part of the month. The precipitation outlooks coincides quite well with what we are predicting above. Troughs continually moving out of the West (either Northwest or Southwest) will most likely mean we see at least a few soggy, multi-day storm systems through the month of May. In short, we expect temperatures in May 2016 to be at or below average and precipitation to be slightly above average overall.